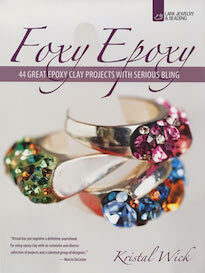 Check out our Show & Tell forum folder some amazing jewelry eye candy. Take a risk in your jewelry design. Why a risky color choice works. 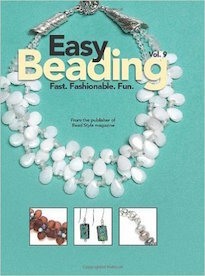 Barbe reviews The Fabulous Fabric Beads book. Take a look! 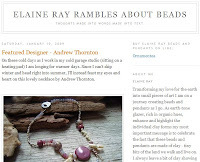 Erin posted some great new stuff to tie in with the March 2009 issue of BeadStyle magazine. Carmi wishes she was going to the prom with her "Urban Corsage" project. Jennifer highlights a few posts to help with your jewelry business. How about improving your design skills in 2009? 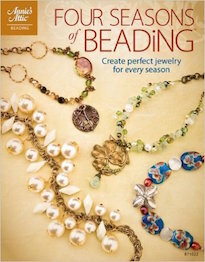 Katie shares more DIY tips for stylish and fun beading. Check it out! Jean was interviewed by the fabulous and brilliant Barb Switzer! What an honor! 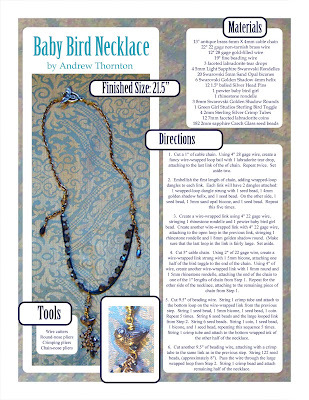 Amidst the preparations for the Tucson shows, Andrew whipped a cute Baby Bird Necklace with a new Green Girl Studios fine pewter piece. We'll be bringing two new fine pewter designs and debuting two brand-new designs at the Tucson bead shows. THAT'S FOUR NEW PEWTER DESIGNS! Folks may remember the "Woodland Scene" bead (with the owl, bunny, and luna moth on it) and the butterfly ball from Bead & Button Show last year. Those were cast in shibuichi. We'll be re-releasing them in fine pewter. The baby bird bead and the sugar skull are brand new! So make sure to stop by and say hello, check out the new beads along with your long-time favorites, and grab some tea! Last night, when we rolled across the vast flatlands of Texas and New Mexico, it was already dark. My eyes were trained on the carpet of stars above and not much on the landscape draped in darkness and shadowy silhouettes hard to make out. 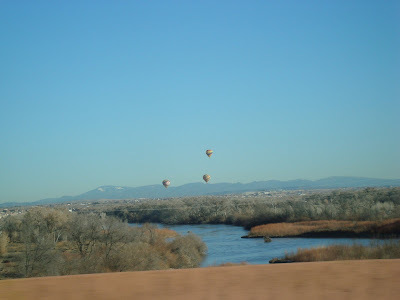 Upon leaving the city, I saw some hot air balloons off in the distance. Ever since I was a kid, I remembered looking at postcards of the city of my birth and saw hot air balloons. I always wondered if there were actually hot air balloons or if it was just a once in awhile thing. Upon leaving, I saw a couple out over near the horizon, lifting off into the big sky. 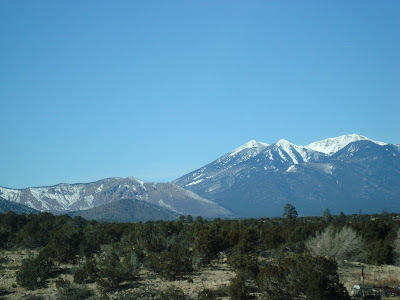 Above is a picture of the mountains around Flagstaff taken about 30 miles back. It was strange to see the snow there. It seemed like a cold reminder of where we had just come from, a wintry land bearded with icicles and frost. As we wove our way through the mountains around Flagstaff, the landscape started drying out and warming up. My face was pressed against the window, my skin trying to drink up the rays of light. It surprised me that it could be so bright and so warm. I made mental notes of the shifts in trees and birds. Each area seemed to have it's particular vibe, from snow-laden evergreens with giant fat ravens perched in the branches to tall cacti with dusty brown birds darting around the spines. After a stop in Phoenix to visit briefly with a friend, we continued on our way to Tucson, moving further out into the desert country. 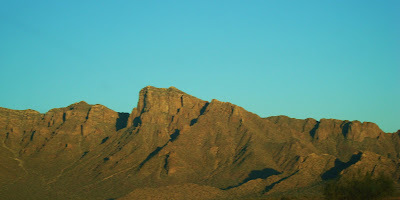 Just around sunset, we saw the familiar mountain ranges that fringe Tucson. They seemed like a ragged smile of an old friend. 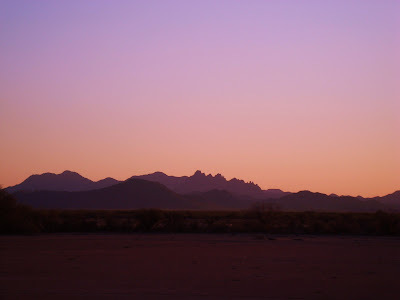 I clicked my hellos with my camera, snapping blurry images of the desert at dusk, bathed in a lavender light and cool shadows. 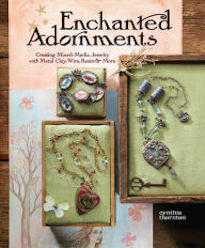 Cynthia has been working like crazy on her book for Interweave Press. I created the above "Sneak Peek" to whet your appetite. I can assure you, this book is going to be monumental! She's poured so much love and devotion into the book, that if it captures a fraction of the magic that went into its making, it'll still be a stellar addition to anyone's library. IT'S AMAZING! This will be a short post since I've been on the road all day (over 17 hours) and am looking forward to a hot shower and a nice cozy bed to climb into. Early this morning we started off in Memphis and made our way across Arkansas. My eyes traced the looping patterns the flocks of birds made, dipping and swooping. When we stopped for breakfast, I kept fantasizing that we'd run into the author of the Sookie Stackhouse books since she's from that area. Though I doubt she'd be at the Cracker Barrel. The pictures above are of the wintry scenery along the road in Oklahoma, a huge wind turbine blade, a rock at sunset in Sayre, OK (close to the Texas border), and the view from our room here in Albuquerque, the land of my birth. You might recognize The Bead Maven (a.k.a. Scarlett Lanson, Contributing Editor to Beadwork Magazine) as a Create-Your-Style Swarovski Contest winner and a finalist in KGI Worldwide Design Competition. Familiar with the contest scene, she has just announced a new contest of her very own called, The Use the Muse Contest. CLICK HERE to get more information and find out how to enter and win! I am in LOVE with shibuichi. 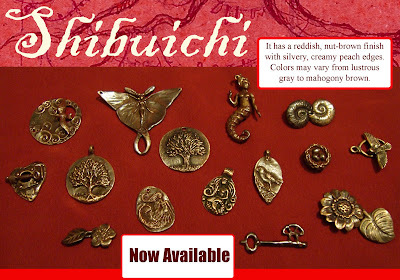 Shibuichi is a copper-silver alloy with a history that stretches back to ancient Japan. It was then used mostly for sword hilts. With the invention of the gun, the legacy of this wonderful alloy seemingly disappeared into the shadows of history. However, in recent years, there has been a resurgence of this dazzling material. The pieces above are from my family at Green Girl Studios. Aren't they wonderful? Make sure to check them out in person at one of the three shows I'll be at in Tucson. We've been driving all day, enjoying a bounty of beef jerky and the Sookie Stackhouse books on tape. Tonight we stopped in Memphis, TN to stay the night with Greg's brother, Mike and his wife Stacey. They are so incredibly nice and I've had the most delightful time catching up with them. They really do have a beautiful home in a very hip part of Memphis, filled with cute little art galleries, coffeeshops, and gift stores. Tonight we had Indian food and I enjoyed Stacey's stories about her work at St. Jude's Hospital. She's doing amazing work and I am so proud to know someone who is really making a difference and is actually on the hunt for the cure for cancer. If you can do it, please take a moment to donate what you can to the cause. No matter what the financial circumstances of a child with cancer is, they won't turn anyone away and will treat them free of charge. It costs roughly a million dollars A DAY to operate this shining example of what a hospital should be. CLICK HERE to donate. Have you seen the latest Winter issue of Stringing Magazine? It's HOT! 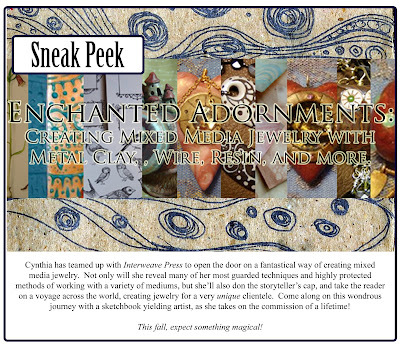 Not only is there are really great piece (Woodland Birds) by my sister, Cynthia, but there is also a dreamy Beads to Buy spread about one of my favorite creatures: OWLS! I love Stringing Magazine. This is definitely an issue not to miss! Here's a new design I made that I've named, Baby Bird Necklace. The piece has a new fine pewter piece by my family at Green Girl Studios. Click on the picture for a larger view and to read the instructions more clearly. OH! And stop by one of the three shows that we're doing in Tucson to pick up some of our new pewter beads (the baby bird one being one of them)! I first encountered Elaine Ray's ceramic pieces at Ornamentea in Raleigh, NC. Ornamentea is one of my favorite bead stores - a real great collection of some of my favorite things from some of my favorite people. Using simple, clean design, Elaine creates pieces that are both easy and comfortable to wear and inspirational for any designer to work with. Not too long ago, I was bogged down by some winter blues and I couldn't help but dream of warmer days. This is the piece that resulted. It's very organic and I think recalls days lazing about under the summer sun. Elaine found it and featured it in a spotlight on her blog. CLICK HERE to see the post she wrote. A double dose of Divali Glass Jewelry: The Winter Sale starts on Saturday! And Carter is now selling her loose beads on Bead Trust. How are your 2009 jewelry resolutions going so far? Are you staying focused? Take this quick poll and see the results tabulated so far. 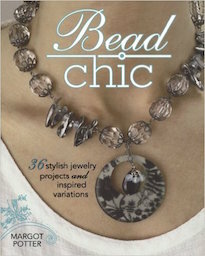 Have a few art bead pieces you'd like to enter in a contest? ABS has a list of the current competitions accepting entries. Carmi makes a fun denim ribbon corsage in under 30 minutes! Jennifer shows off her new packaging for some of her beads. Jamee Jones shares her gorgeous Hawaii-inspired jewelry! Jean flips for a jewelry book inspired by the Impressionists! Andrew talks about and shares a little bit about his obsession with opalescent glass. Get a sneak-peek at his horde! We've been feasting pretty mightily lately. Our specialities differ and each one of us brings something different to the table. Although I've mentioned it on my blog before, I don't mind saying it again: Greg is the Cookie Master! 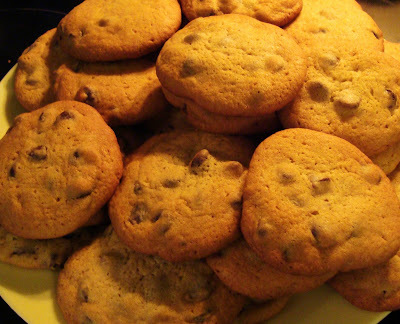 Above is a picture of some chocolate chip cookies that he whipped up. They were so good! I particularly liked them straight out of the oven - the chocolate molten and the dough still soft. I've been on an apple crisp kick. 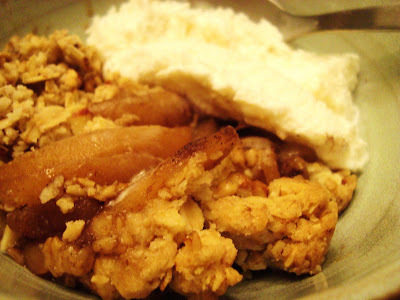 Above is a picture of an easy apple crisp with vanilla ice cream. The topping is super simple: sugar, butter, oatmeal (I use rolled and Irish oatmeal), flour, walnuts, sliced almonds, and graham cracker crumbs. The apples were tossed in Vietnamese cinnamon, cardamon, nutmeg, and a little brown sugar. I had candied some blood oranges and thought that I'd use them to make some blood orange glazed chicken. The above picture shows the chicken on top of a mound of rice soaking up all the sweet and tangy sauce. 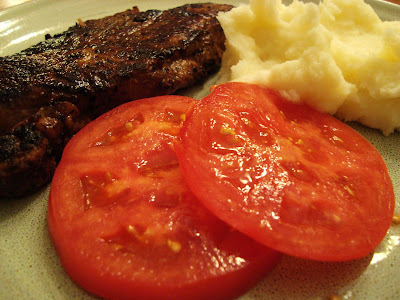 Greg made the meal above: a pan seared and broiled steak, salted and sliced vine-ripened tomatoes, and fluffy mashed potatoes. The meal was great! It was very flavorful and seemed like a classic combination. 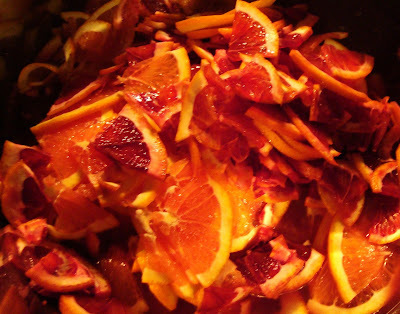 The above picture shows sliced cara cara and blood oranges. I had prepared them to make my (in)famous marmalade. I took a Martha Stewart recipe and modified it with some personal touches. It's a fickle thing, but when it does turn out... it's excellent. It makes a perfect glaze for meats, a spread for toast or English muffins, or is the perfect and unexpected filling to mini-tart shells. Of all the meals that I've made, I think this one was the one that received the most compliments. 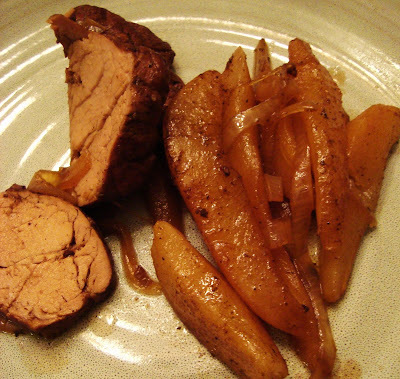 I made a pork tenderloin with roasted pear spears and sliced onions. It's an unexpected combination that works. One wouldn't automatically put pears and onions together, (at least I wouldn't), but roasted together in a covered ceramic dish that my sister Sheila made, tossed in olive oil and salt and pepper, the disparate ingredients melded perfectly. 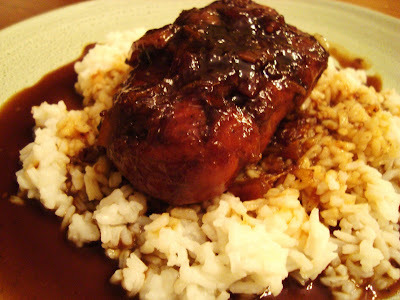 After pan searing, the pork tenderloin was added to the mixture and drenched in a garlic, maple syrup, and balsamic vinegar glaze. The meat turned out so tender and succulent. Knives weren't needed here; a fork sufficed! Time and the world and the person only meet a single time. Yesterday Azalea and I thought that we'd like to feed the birds and make them a snack. At that moment, two memories collided. One was of THIS post from Ullabenulla about remembering our feathered friends and another was a project that either I did in elementary school (or heard about so many times that I've adopted it into my subconscious as something that I actually did). First we picked out our apples. Then I cut the steel wire. We both bent our wires and embedded them in the apples so that they would hang and so that they'd be easier to handle. Then we covered the entire apples with peanut butter and then rolled the apples in bird seeds. They turned out pretty nice! Then we went out to hang them up. We were having a problem finding just the right branches to hang them from and it was getting cold out, so we decided to leave them on one of the bird feeders. Melissa J. Lee is celebrating her son's birthday with lots of giveaways. She's got fine silver components and even a necklace up for grabs, as well as discounts in her Etsy store! Wow! Make sure to drop by and check it out. CLICK HERE to go to her blog post about it. My good friend, Kathy Callahan, will have one of her video pieces up at the Katonah Museum in Katonah, NY. She'll be participating in a group show titled "Contemporary Confrontations", It runs 1/25 - 2/22. Opening reception is Sat, 1/24 from 5-7 p.m.
Artists are remarkable barometers. We live in a time that calls for great change in the United States – in our politics, our economic policies, and our relations with countries around the globe. This exhibition seeks art that comments on current events and posits hopes for the future. The art may be abstract or figurative. In view of the recent death of Robert Rauschenberg, particular interest will be shown to works that explore new approaches to assemblage and collage. It's been over a decade since Duncan Sheik first debuted with his self-titled album in 1996. I'm fairly certain that I wasn't the only one who had Barely Breathing stuck in their head for the next year. Evidence of this can be found at the top of many music charts as the most played song of 1997 and a Grammy nomination in 1998 for his efforts. My admiration and appreciation for his music didn't end there. I followed his career over the next four albums and even saw about half a dozen of his shows during his last tour for White Limousine. 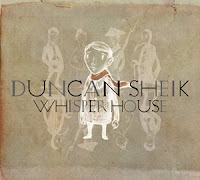 His latest endeavour, Whisper House, is slated for release on January 27th, 2009. Duncan Sheik teams up with Holly Brook in this 10 song album. He uses narrative driven lyrics to tell the story (from different ghosts' perspectives) of the lives lived in a WWII-era lighthouse in Maine. Unfortunatley, I'll still be out of town, but the CD release show will take place at The Bell House in Brooklyn on January 26th, 2009 at 8PM. Check it out if you're around! While I was on hiatus from the blog world, I found out that my piece, Through the Woods, is one of the 25 finalists for the Staedtler Bottle of Hope Challenge! The finalists will compete for three spots: Best in Show, Best Expression of Hope, and People's Choice. If you're attending the 2009 Winter CHA show, be sure to stop by the Staedtler booth to vote for my piece. Don't forget! The winner will be announced Monday, January 26th, at 2:00 p.m. at the Staedtler booth. I don't generally write about politics on my blog. I feel that people's political choices are their own and if made in good conscious with the best intentions, should be respected. But I think that the inauguration, despite political encampments or dividing lines, was truly a spectacular event filled with hope. It's hard for me to remember any other moment where I felt so acutely patriotic or proud to be an American. One of the highlights of the event, I think, was the performance of John William's composition, Air and Simple Gifts, by Itzhak Pearlman and Yo-Yo Ma. Out of the years that I've lived in Asheville off and on, I can't recall a time when it snowed and it stuck this much. Normally, it melts before it touches the ground or melts by the next day. These past few days, the gentle flurries and dustings of snow have stuck. Usually I detest the snow and see it as a huge hindrance to getting around and doing stuff. However, this snow has been very beautiful and playing with Azalea out in the snow has been a lot of fun. Above is a picture of the faerie fort they made out in the backyard covered in a light powdering. I think it's important to remember our little airborne friends when it's cold like this. They spend so much time eating and trying to collect food for energy to fly. I like the idea of creating a safe place for them to find a little food safely and without worrying about too many predators. Not to mention that it's a lot of fun to watch them up close. I'm partial to house sparrows, chickadees, and finches. The above picture on the left is a picture of some feathered friends enjoying a feast of seeds. To the right is a picture of a piece of lawn sculpture. I do believe that I've captured this face in many different conditions and in all of the different seasons. It's interesting to see it in its many guises. I've been meaning to thank everyone for their kind words concerning both Amelia's death and my grandma's. They were definitely a help in this hard time. It's weird, because death is something that is very connected with life and is ever present and surrounds us completely. From the dying of the sun each day, to the spinning of the wheel of the year, to the trees shedding their leaves... in other parts of the world, it's even more apparent and the lives of those they love are thought of as mere transitory visits, brief and beautiful, but without a doubt a thing that will end. We all understand this concept, but at the very heart of it, it's as though we're saying goodbye to someone we love and no matter how much we can rationalize the hurt and pain away with words of calm, words of wisdom, or verses from religious source, it does not change the sting of having someone very much beloved ripped away. With that said, we are trying very hard to carry on and move forward without too much grief. We are not privileged enough to despair completely and languish in our misery. Instead of sadness, we must opt for hope and love. We must carry on and be strong. The times are calling us to be strong and hopeful. The times are calling us to remember and reflect, but not to wallow. We must build higher and greater visions, honoring those who have passed, but striving ever forward. So, that we will do... we will be what the times call for us to be. Above is a video I took of Azalea's xylophone concert. She said she wrote and played the song just for me. It's been a week since I've last posted. It feels so strange to have been away for so long. It's probably one of the longest absences I've taken from blogging. My grandma died and I wanted to spend time devoted to my family. The little things, like making dinner and washing dishes and running after my niece, were a balm to soothe the hurt. Some days, despite the daily distractions of living, it was hard to get out of bed and get going. Those were usually cold mornings - ones where the world outside seemed a little too much and burrowing down into the comfort and safety of the cocoon of blankets was all there was to do to get through. 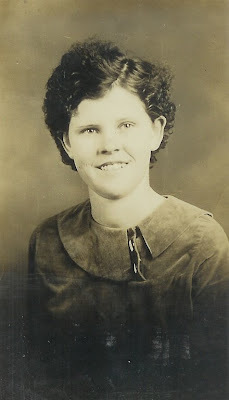 My grandma, Attrice, was born on April 3rd, 1920 in Center Ridge, Arkansas to Lee Ernest and Margaret (Bryant) Holloway. She never went by her first name, but instead went by Aulene. She said that her grandmother dubbed her with the name and it stuck. Even her own son, (my uncle), was originally called, Brian, but eventually was tagged by my great great grandma with the name, Jerry. My grandma got married to my grandpa, Roland Thornton, on November 16th, 1940. They had four children. Above is a picture of my grandma holding my Uncle Jerry in front of their first house. My grandpa built the log cabin himself. They didn't have a lot of money. My grandpa was in the service until he was injured in Germany during World War II. Afterwards, they primarily farmed and worked odd jobs like picking cotton and selling watermelons. Grandma also did canning and sewing on the side to help ends meet. 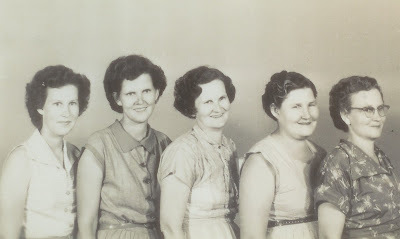 Grandma is pictured with her four sisters in the image above. From left to right: Edna Mae, Aulene (my grandma), Bernice, Laverne, and Ola. Grandma also had three brothers. 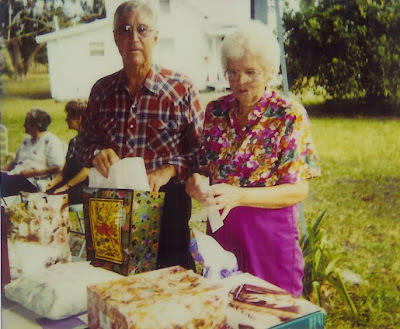 After Aunt Edna Mae died a week before my grandma, she was the last surviving sibling. 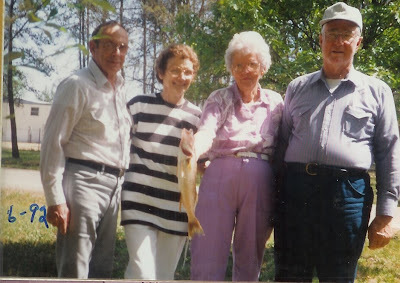 In this picture taken in the summer of '92, grandma is holding a fish they caught with my grandpa and their friends, Adeline and Omar. Grandma and grandpa were always fishing. Grandpa found great amusement in taking us grandchildren out on the boat and sidling up to the gators. Some of the best fish I've ever had was sitting at her kitchen table. She'd Fry Daddy some crappie (pronounced /ˈkrɑpiː/) and fry up some potatoes. Grandma was such a good cook. She had a talent of taking a few simple ingredients and making really satisfying and delicious food. Above is a picture of my grandpa and grandma at their 50th wedding anniversary. All of their friends had organized the party. Both of them were extremely popular and were always going to see someone or have someone come by. It seemed like there was always a family friend from the Ozarks or a neighbor dropping by to say hello or gossip a little. Grandma was sassy. She'd tell it like it was. She'd never say anything negative about anyone, at least not without first prefacing it with, "Bless their soul..."
Grandma lived to be 88. The picture above was taken at one of her birthday celebrations. 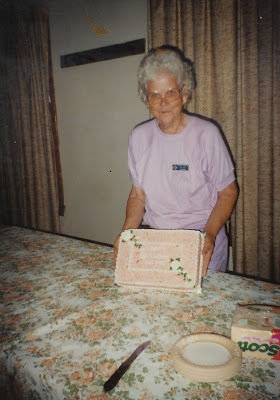 I remember that she was quite pleased with the cake because of the white roses on the cake. She had a beautiful garden. I remember that she had a rose bush that had the most intoxicating smelling roses that were easily the size of my face and pots and pots of orchids. She took great pride in her garden and flowers. 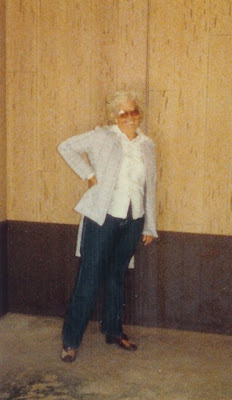 Here's a picture of grandma striking a pose and strutting for the camera. This photo was taken in 1982. 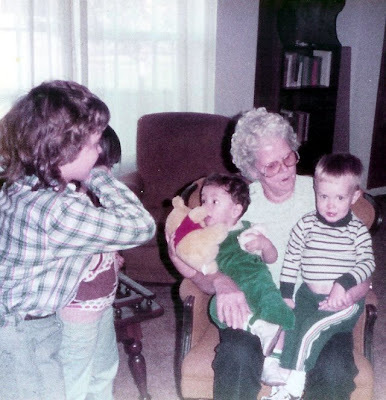 Above is a picture of my grandma holding me and my cousin James. We used to spend the summers at grandma's house for as long as I can remember back. One summer, they were having work done on their septic tank, which revealed a rich vein of Ozark clay. James and I asked if we could make mud paddies on the back step. Sheila and my cousin Donald came around and smashed the paddies. Grandma got furious at them for ruining our mud paddies and for getting mud stains on their great big white house. She told me a story about how when she was a girl, she and her sisters would go down by the river to make little sculptures and her brother, CF smashed her sculptures. So, she understood and always made sure that the "little ones" got a chance to make stuff. 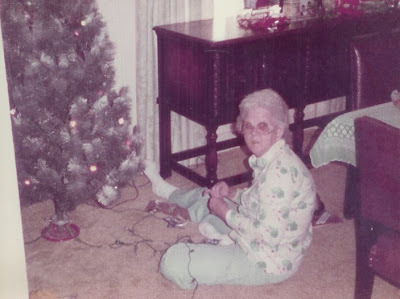 I think those many years of hardwork led grandma to become very fun-loving. She was a fearsome game player and she'd throw down with any of us kids. We'd play Sorry! and Hand and Foot. She wouldn't let any of us win unless we won on our own merits. My grandma was the supreme crafter. She was always sewing or making dolls or quilting. 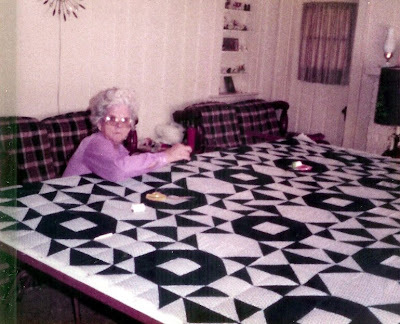 I remember one summer, grandma took my sisters and my female cousins to the quilting circle at the local church. I, of course, wanted to go. I was my grandma's little shadow and was always curious what she was doing and making. Also, if Sheila could do it, then I could do it too. At least that was my logic back then. The boys went to the bait shop. It was interesting, but I still wanted to go with grandma. After they came back, grandma took me into her sewing room, which was usually off limits to us kids and she showed me how to sew. 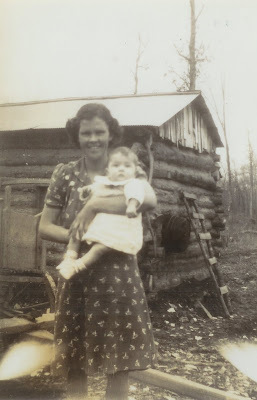 I miss my grandma, but I am comforted by many memories of her. My grandma died yesterday and I have nothing to say today. 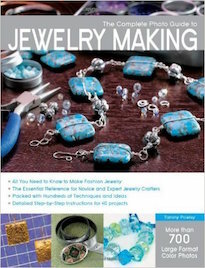 Since many of us are trying to get our jewelry studios organized this year, Tammy collected some excellent ideas to help out jewelry designers and crafters of all kinds. Art Bead Scene's January Challenge is Inspired by Irises. 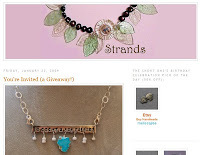 Enter a piece of jewelry and win free beads. Jill's teaching at a retreat; check out the information. Carmi has a short demo using the new Sticky Back canvas. Carter looks forward to the exciting year ahead and shares some photos from her time away from beads. Gather some New Years inspiration from the Jangles Blog. Cyndi is hosting an educational blitz this month, and she's wondering if you know of classes she should add to the list. Looking for new shopping opportunities? Melissa suggests visiting your local rock shop! 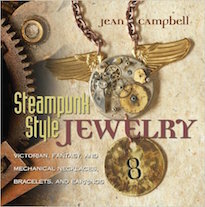 Andrew creates a buying guide of skull related beads and pendants. 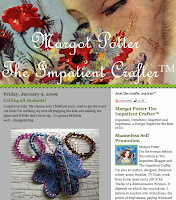 Known by many names, The Impatient Beader™, The Impatient Blogger™, The Impatient Crafter™, The Sparktastic Fantastic Queen herself, Margot Potter, is looking to fill her Swarovski class in Tucson and at CHA. 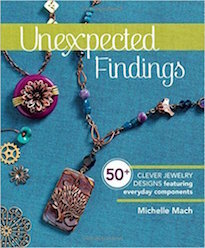 Why not treat yourself to a class with this recognized author and crafter? She's truly one of the most entertaining people I know and she'll be giving out lots of free swag in her classes. CLICK HERE to find out more. So, do yourself a favor – take a class with Margot. She'll treat you right. It might seem morbid, but I've delved into some research to help cope with the recent events. While the desire to languish is strong, I find that work, especially all-consuming work, is the best remedy for grief. The act of doing something and hopefully inspiring others to do something is a powerful medicine. I've composed a shopping guide of different skull themed beads and pendants. A) Glazed ceramic pendant by Gaea. B) Fused dichroic glass pendant by Etsy seller, artdefleur. C) Printed shrink plastic by Etsy seller, artsyathina. D) Soldered glass tarot card pendant necklace by Julie Johnson. E) Copper Day of the Dead pendant by Christina and Marisol of Wink Artisans. Check out their BLOG. All of the above glazed ceramic pendants are made by Melanie Brooks Lukacs of Earthenwood Studio. They belong to her Spooky Head series. A) Glazed ceramic pendant by Gaea. B) Fused glass piece by Jamie Burress. C) Optical illusion skull embedded in a resin-filled bottle-cap by Amanda Anspach. D) Day of the Dead sugar skull altered Scrabble tile pendant by Etsy seller, thegildedlily. E) Glazed ceramic pendant by Surly Amy of surlyramics.com. All of the above pieces were made by Amy Johnson of Tank fire + metal. A) Acid green and lavender skull and crossbones. B) Lemon yellow skull and ochre cross bones. C) Red skull and purple crossbones. D) Tangerine skull and seafoam crossbones. E) Mossy green skull. F) White skull with black crossbones. G) Purple skull with red crossbones. A) Antique gold-toned skull charm with bail from Twyla, Etsy seller, xSuppliesx. B) Electroformed lampwork glass by Etsy seller, boobiebeads. C) Tan plastic skull beads from Audrey of viragocreations. D) Lampwork skull bead from by Lindsey, Etsy seller, LilCarltonCreations. E) 12 piece Gumball skull charm from Holly. A) Glazed ceramic pendant by Gaea. B) Pressed Bronze Clay Skull coin by Green Girl Studios. C) Printed plastic pendant by Holly Modine. D) Fabricated sterling silver tag by Lauren Mojica. E) Vintage Hamlet Skull Illustration embedded in resin by The LAM Collective. All of the above pieces were made by Michael Craig, the self-proclaimed, "Flaming Fool." Check out his WEBSITE. You can find more of his work on Etsy, under the seller name, flamingfool. A) Flower skull 7. B) Skull 5. C) Encased skull 27. D) Flower skull 12. E) Encased skull 28. A) Painted polymer memento mori skull bead set by Etsy seller, hibernacular. B) Polymer girly skull by Jackie of Beary Sweet Beads. Check out her BLOG. C) Black resin skull charm by Fredric Hamby. D) Lot of 15 Jolly Roger Bright skull charms by Etsy seller, Scissorshappy. E) Bisque Glazed Porcelain bead by Joan Miller. A) Felted, embroidered and beaded sugar skull brooch by Etsy seller, ladybug9753. B) Lead-free pewter Smiling Skull by Green Girl Studios. C) Bisque glazed porcelain by Joan Miller. D) Skeleton key charm from Etsy seller, doubleangeldesign. E) Pirate poison lampwork aromatherapy vessel in Ivory by Etsy seller, flamekeeper. Check out her BLOG. 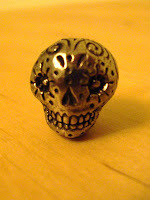 A) Sterling silver sugar skull barrel bead by Anne Choi. B) 10 Pressed Czech glass from Beadaholique. C) Lead-free pewter Fandango skull by Green Girl Studios. D) Glass beads from Artchix. E) Black acrylic charm by Duplicate Daughters. A) Fine silver "skully" charm by Melissa J. Lee. B) Day of the Dead Calavera resin pendant by Etsy seller, UrbanBead. C) Pirate skull bisque glazed porcelain by Joan Miller. D) Altered Scrabbled tile pendant by Etsy seller, theinkling. Check out her BLOG. E) Carved bone Tango skull with rose from Etsy seller, supplystudio504. All of the above beads and charms can be found at Fusion Beads. A) Copper-plated sugar skull. B) Gold-plated sugar skull. C) Sterling silver skull and crossbones charm. D) Open-mouth Sterling Silver skull charm. A) Miguel de Cervantes Sterling silver Flower Skull bead by Anne Choi. The sides read, "Until death, it is all life." B) Black resin skull by Etsy seller, brownbagstudio. C) Polymer Day of the Dead sugar skulls by Laura of Zoeowyn. Check out her BLOG. D) Fine silver "skully" coin by Melissa J. Lee. E) Felted Skull Hair Accessories from Etsy seller, geckoartist. I originally met the lovely folks at Anima Designs at a Bead Mercantile Show in Pittsburgh many years ago and again was neighbors with them in Tucson a few years back. I love their stuff! They've got such a great assortment of fun and funky vintage finds. They've got an entire section on skull beads. The ones below are examples of some of the awesome skull beads they've got to offer. A) Carved pale green jade skulls. B) Large ceramic raku skull beads. C) Carved bone bead. D) Resin skull beads. E) Carved yellow jade skull. F) Unglazed porcelain skull beads. A) Large carved bone Indonesian skull bead. B) Carved large copal skull bead. C) Carved bone mala bracelet. D) Carved turquoise skull beads. E) Black ceramic skull beads.